Wired Magazine is so content-rich that I often save it for plane flights, brainstorming mornings or train travel. It’s regularly so brilliant that I don’t trust myself to use it as my before-bed reading as I’m likely to read something and then have crazy Einstein dreams all night long. 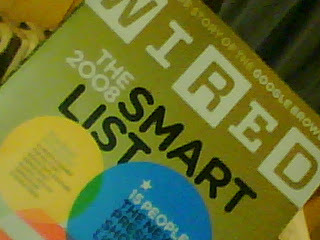 Coincidentally, the October issue features the 2008 Smart List as its lead feature. This piece starts out by explaining that the magazine has spoken with 15 smart people who have “big ideas about how to fix the things that need fixing” for the next president – whoever that might be. From telling the next president that he shouldn’t pay much attention to India and instead focus on places like Mexico, Canada, Egypt, Colombia and Uzbekistan, to the dictum that Washington DC has to become aware of how to use the Web and finally enter the 21st century, this is mind-wrenching stuff. Looking for a lighter piece? Wired always has fun stuff like the interview with John Hodgman on page 108. Writer Adam Rogers does a great job in letting Hodgman explain how he’s an expert on everything and how his next book – More Information Than You Require – proves that assertion. Other highlights in this issue include the one-page piece telling you exactly what’s inside Orbit Gum. Don’t be surprised, it includes formaldehyde. Tasty. And be sure to flip over to page 68 for the product test of three cell phones that purport to be iPhone wannabes. Near the back of this issue is the profile of Weird Al Yankovic by Brian Raftery. The author spends enough time with Yankovic to detail the artist’s decades in the business from his first music video 25 years ago to his recent 47-stop tour. You’ll learn a lot about the musician’s motivation and creative process in this nicely paced article. And lastly, there’s a true science feature that talks about how some scientists are trying to put a barcode on everything on Earth. Maybe not ON each tree, animal, and curtain. But they’re showing it’s possible to code things so perfectly that identification becomes easy as reading a number.